In The Anatomy of Fascism, Robert O. Paxton examines fascist movements, primarily in Germany and Italy, to create a thorough explanation of what constitutes fascism. To define the boundaries and stages that makeup fascism, Paxton spends the majority of the book examining fascism in two of the locations where it was most successful, violent, and noteworthy: Italy and Germany. Paxton examines the examples of Fascist Italy and Nazi Germany in comparison to each other – and occasionally in contrast to other regimes often considered fascist, such as Francoist Spain – to understand the differences not just in how authoritarian leaders got into power, but in their actions once they were in control. For example, Paxton argues that one of the defining qualities of a fascist power is its appeals to the public and popular support in years before ascension to power as well as after taking power – something characteristic of both Adolf Hitler and Benito Mussolini’s reign in their respective countries. Paxton closely examines the history of fascist movements in Germany and Italy, which provides insight into the history of those two countries at pivotal moments. The comparison demonstrates clear parallels between the two countries fascist movements as well as the failure of democracy in each these two countries. The examples of these two movements make Paxton’s argument convincing. His portrayal of the rise of fascism was as much a failure of democracy as it was the rise of an authoritarian group of thugs. Fascists successfully took advantage of democratic institutions for non-democratic ends. 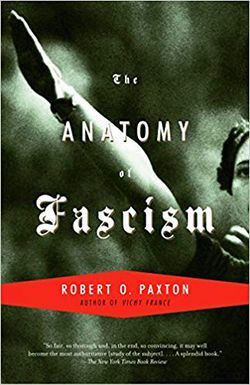 One of Paxton’s greatest strengths in The Anatomy of Fascism is that he successfully examines how fascism operated in Italy and Germany while also rightly dismissing theories which explained away the rise fascism with simplistic explanations. Explanations that often missed the key reasons for the rise of fascism, especially in Germany and Italy. Paxton presents the history of fascism in a way which demonstrates that the complex ways authoritarians took power and some of the nuances which differentiate one fascist movement from another. To do this, Paxton examines the history of German and Italian fascism fairly in-depth, documenting and comparing how both of these examples gained support, utilized violence, and were helped to power by elected officials who would rather work with fascists than socialists or communists. This last point is of particular interest because Paxton uses it to diminish the myth of Mussolini’s “March on Rome” – in other words, he argues that fascists didn’t simply use brute force to gain power. While the coup staged by fascists in Romania is discussed, it is primarily shown in contrast to the paths taken by Hitler and Mussolini, which was not a violent uprising. In the last chapter of The Anatomy of Fascism, Paxton offers up a definition and a list of ideas or “mobilizing passions” which define a fascist movement. As Paxton admits, these ideals are rarely explicitly stated by fascists but are rather implied in fascist language and action. This is a good approach, for the most part, but it is in some ways almost contradictory. Paxton himself discusses some of the problems associated with creating a singular definition for fascism, and while the definition that he offers here offers more room for differentiation between fascist movements, it is still somewhat limiting. Still, Paxton’s definition is effective, and his focus on actions is important because it is an essential part of informing not just fascist behavior but fascist language as well. Paxton’s definition here seems widely applicable, and his emphasis on fascism as a product born of failed democracies is an interesting one which is greatly important to understanding the growth of fascist movements in Europe in the early 20th century. While important distinctions like these are drawn for Italy and Germany, the focus on these two states seems too narrow at times. If one of the main goals of this work is to examine fascism as a whole, then it should be necessary to examine fascism in depth in more places than just Italy and Germany. Fascist movements in Chile and Argentina are briefly mentioned, and while their example is welcome and an interesting comparison to their European counterparts, a more detailed and thorough analysis of non-European fascist movements seem almost essential to identifying what fascism is. Other examples are briefly mentioned, such as Romania and Spain, but these are largely used to argue against certain movements being fascist or to make the case about German and Italian fascism stronger. Some of these examples are very effective, such as the use of the Spanish example to show the importance of public support for a fascist movement, but more of this type of comparison, especially between fascist states like Romania, would have been beneficial to producing a more well-rounded analysis of fascism. Despite its somewhat limiting approach, The Anatomy of Fascism provides insight into the growth and operation of fascism in Europe. Paxton offers persuasive arguments that fascism emerges with democracy fails. Fascists then navigate to power through a combination of violence, the manipulation of democratic institutions, popular support, and the assistance of elected officials.